This year marks the 20th anniversary of one of Australia’s iconic feature films: ‘The Castle’. It‘s a comedy with a message. The government attempts to compulsorily acquire the house of the working class Kerrigan family to make way for an airport extension but the Kerrigans fight the decision all the way to the High Court. The Kerrigans’ house is much more than just a place of shelter; it is a real home, based on bonds of affection, love and generosity – and idiosyncrasies. To the Kerrigans, it is, indeed, a castle. The film’s message is two-fold: a home is something precious, the basis for security, neighbourliness and social reciprocity, not just real estate. The other message is that an individual, or group, should always be willing to stand up to authority when they feel they are being treated unjustly. If you don’t fight, you lose. ‘The Castle’ promotes the Great Australian Dream of home ownership. But as the film demonstrates, no-one has an absolute right to their property. Peoples’ homes can be compulsorily acquired by governments to make way for major projects that serve the wider social good, such as freeways, hospitals, railways and, yes, airports. Section 51 (xxxi) of the Australian Constitution stipulates that any seizure of property must be on ‘just terms’. When the Kerrigans’ bumbling lawyer appears before the Federal Court, the judge asks him to specify which section of the Constitution has been breached. In one of the funniest and most memorable lines in the film, he replies: ‘Section … what section? There is no one section … it’s just the vibe of the thing’. The ‘vibe’ can be traced back to the Magna Carta of the thirteenth century. Magna Carta set parameters on how far the monarch – the state – can intrude into our lives. Chapter 39 provides that no freeman will be seized, dispossessed of his property, or harmed except ‘by the law of the land’. The various State laws that cover compulsory acquisition of property take ‘just terms’ to mean fair compensation, including payment for the inconvenience of relocation. 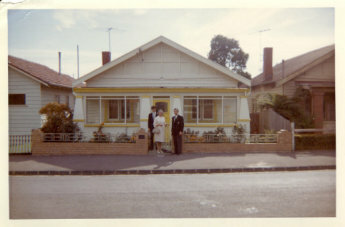 Barry York and his parents outside their 'castle' in Shamrock Street, West Brunswick, Melbourne in 1966.